#1 Choice for CNA / PCT in Tampa Bay ! We wrote the BOOK on CNA Training ! Don't worry, we will hand walk you through process on 1st class day. TampaBayCNA.com has been in business for 16 years - assisted over 13K people to take the Exam / Get Licensed Certified by the State of Florida Board of Nursing. We wrote the Training Manual for Certified Nursing Assistant Clinical Skills training. 3. State of Florida Test Requirements: No Experience Necessary / GED not required if over 18 or older. The CNA TEST is a State of Florida Board of Nursing government test. It currently takes 3 to 4 weeks (may vary) for a testing date. Must be 18+ (GED NOT Required 8th grade level of reading and math skills required.) and Pass a Level 2 FBI Background Check. The test is both a demonstration of clinical skills plus a written test. You are required to know how to properly demonstrate the CNA Clinical Skills and pass a written test give by the Sate of Florida Board of Nursing. You must also have a government issued photo ID and a social security number (testing purposes only) There is NOT a NATIONAL CNA License, every state has their own Laws and Rules to become a Licensed CNA. E(3) - Challenger test for those who have never taken any formal training or worked in healthcare. E(4) - Other Training - CNA Examination Preparation Class / or/ those who have been taught CNA by facilities. Tampa Bay CNA Students test under the E(4) Other Training Test Classification. 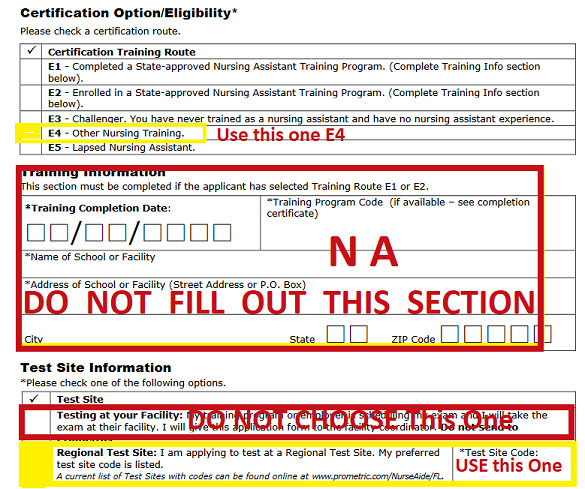 If you fail the Fl Board of Nursing CNA Exam 3 times, then to retest, it is then mandatory to take a form 125 CNA Course from a Tech School or Career College. This is why the PASSING RATE of the training center is very important. Q – When do I test: The C N A Test is given by the State of Florida Board of Nursing – The State of Florida Board of Nursing assigns all testing dates. It can take 3 to 5 weeks to get your test date. Q – Training centers do NOT TEST you or issues the State of Florida Board of Nursing C N A License / Certification – There is NOT any class documentation that will substitute for the Sate of Florida Board of Nursing C N A License. Q – I have a licensed from another state: Out of state C N A license do NOT work in Florida. Contact the Florida Board of Nursing for these questions. (850) 488-0595 Each state has their own laws and rules for CNA. The State of Florida TEST fee is $155 and includes the first period of License. That fee is paid on the government web site when you are ready to schedule your test. We give the codes you need first class day. (We do NOT collect this money) Level 2 Finger Printing and Background Check $90 - If you have not had this done within the last year All Healthcare Professionals are required by law. This must be done before you are scheduled to take your test AFTER you have registered for testing. Paid to Vendor. (We do NOT collect this money). 8. We do NOT offer Phlebotomy Classes. 9. CPR / ACLS / PALS Classes - TampaBayCPR.com or TampaBayACLS.com American Heart Association BLS / CPR Level 2 - for Healthcare Providers Student Discount rate $40 for 2 Yrs- Weekly classes at TampaBayCPR.com It is NOT required to take the State of Florida CNA exam.